This download includes Godzilla vs Bigfoot (a circuit), Cops and Godzilla (a cnr), each shares the same great custom sound track, and Godzilla (a true Monster truck - in a separate pod). The tracks feature many things new to mtm2: Great city textures, a flaming backdrop, a six lane wide start light, tons of new street lights, and this is the first track to use the new building models from Fly!, and much much more. The course weaves in and around a city that has been devastated by Godzilla. You will have to find your way past pavement cracked by Zilla's heavy foot steps, buildings toppled and aflame by this unmerciful monster, and through the debris left in his wake of destruction. Do yourself a favor and run this at dusk with a textured sky and, by all means, crank up the music. The effect is simply amazing. 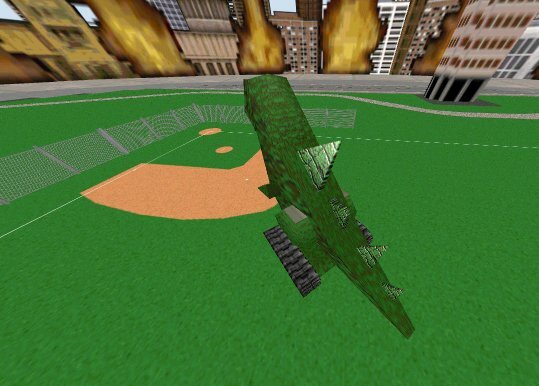 And as a finishing touch, robbers should use the Zilla truck. You will have nowhere to run and hide, but the coppers will have an equally difficult time bringing this monster down. The only track to receive the infamous "rat head" seal of excellence, what more can I say . "You shone like the sun"
I was privileged to see Pink Floyd debut this song back in '75 before the album was released - sheesh, I feel old! Godzilla V Bigfoot - after a long time this is still a quality track that track builders should aspire too. Attention to detail, a THEME, and many other (often overlooked) aspects of this track makes it one to be learned from. I love this level! The best thing is the flames in the backround. Look for the shortcut the CPU trucks take! Of the the five trucks competing two made it to the finals, Godzilla and Bigfoot.